After arriving in Laos, we weren’t quite sure what to expect. Despite it being close neighbours to Thailand, we still experienced a bit of culture shock yet again. We touched down from the slow boat and slugged it from guesthouse to guesthouse until we found one that was up to par. Lately, this has been our go-to method for finding a lodging, as booking online has proved to be more expensive and crappy. Going door to door is simple in most places, since most hostels are often clumped together. Owners are used to backpackers asking to see the rooms and haggling prices is not uncommon. On our first day, Luke wasn’t feeling the best due to our malaria medication so I went solo to sunset yoga. Ock Pop Tok offered sunset yoga right on the Mekong River for 60,000 kip ($8.50 CAD). Jenn was my teacher and she was incredible. The hour and a half class was challenging, but the best part was being able to glance up and see the sun setting over the water. Being a huge yoga fan, it was a surreal moment — I never dreamed I’d be doing yoga on a river in Laos. I’d highly recommend yoga in the great outdoors, wherever you can experience it. The next day, we headed to Tad Sae Waterfall. Brian and Jane caught back up to us sooner than we expected, which was awesome. We all split the cost of a tuk tuk to the waterfall, costing us about $2 each. He drove us 30 minutes to the falls and waited three hours for us to get back and drive us home. Tad Sae Waterfalls – well worth the trek! The waterfalls were stunning. The aqua blue water was like nothing we’ve seen, and the way the water cascaded through the trees made it look like the jungle was flooded. We trekked up the falls until we found the perfect place to go swimming. There was a peaceful patch of water right after a bunch of falls that was refreshing as it was beautiful. We had brought Laos sandwiches (baguette with cucumber, carrot, lots of onion, tomato, and Laughing Cow cheese) for lunch. There were elephant rides at the falls as well. We felt pretty bad for the animals, since they were chained up and had big wooden chairs on top of them so they could offer rides all day. It’s frustrating to see them abused for profit so often here in South East Asia. Nonetheless, getting a chance to see the herd swimming and walking through the falls was pretty fascinating. The night market in town proved to be the best place to grab food. Luke and I bought a soup for $1.50 CAD and she split it into two filling bowls for us. The food is so fresh, you actually pick your veggies and they fry it right in front of you. There was also a buffet where you filled your plate for $1.75 CAD and the cook would fry everything together with some seasoning. In the morning, you can get smoothies, sandwiches, and crepes all for $1.50 CAD each. It’s insanely delicious and cheap. We stayed for four nights in Luang Prabang. Overall, the city was definitely underwhelming. While the travel books glamorized the Luang Prabang as a world heritage site, the quaint city was overrun by Westerners both backpacking and on vacation. So, if you want to get a true taste of Laos, Luang Prabang isn’t the place to seek it. Also, it wasn’t very easy to get around. Tuk tuk’s were the priciest we’ve seen, and scooters cost five times the usual Thai rate to rent. There were a lot of packaged tours available, but the value seemed lacking. If we did it again, we would have cut our trip in half. Regardless, we can’t wait to see what Laos has to offer. P.S The wifi is terrible in Laos. Sorry for the sporadic updates. 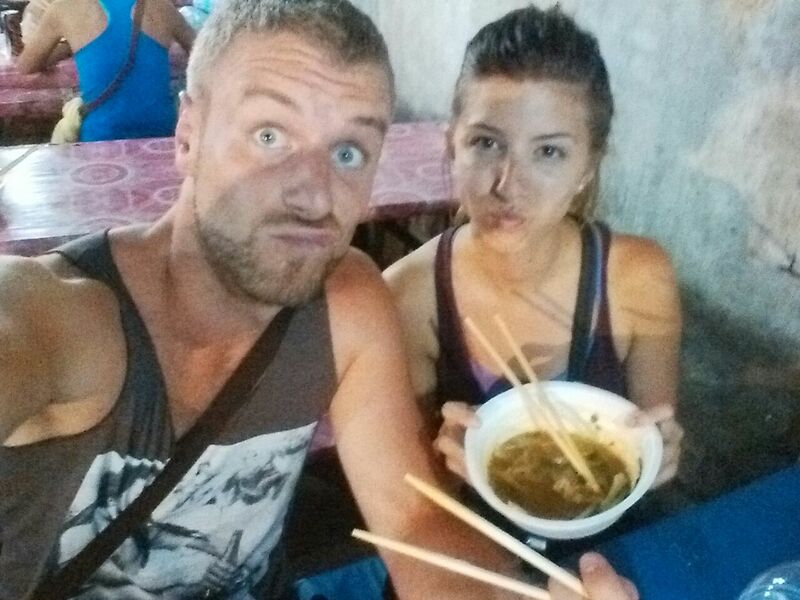 We’re safe and loving life in Vang Vieng, so don’t worry! We love and miss you too 🙂 I have many Luke duck face pictures — only so many the blog can handle, however.